Spring into spring – fresh, free recipe! from My Kids Eat Volume 2! 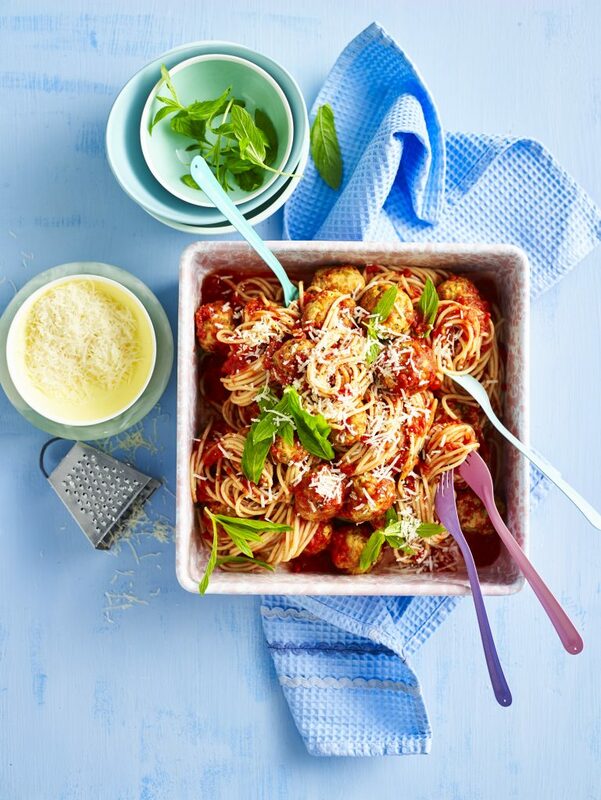 Keep reading for some of my favourite seasonal product for Spring, plus a fresh, free recipe - my Chicken Meatballs! Spring ROCKS here in Australia – the air is warming up, the sun is rising earlier, the twins celebrated their birthday . . . and this year, I’m celebrating the release of My Kids Eat Volume 2! You all know how much I love choosing and cooking the freshest fruits and veggies. There’s nothing better than a completely stocked fridge, with all my veggies washed, trimmed and stored in clear containers, ready to cook with. I love how the different seasons bring different fruits and veggies to enjoy – spring seems to have the best of the best (ok, except for summer – mmmm, mangoes!). I am all about seasonal eating and reducing the carbon footprint of my food. The less time the fresh produce spends on a truck, in a fridge or in a store, the better. Here’s just some of the foods that come into season in spring – does it get your appetite going? Check out my favourites, then scroll down because I’m sharing an EXCLUSIVE free recipe straight from the pages of My Kids Eat Volume 2! I can’t wait for this book to drop – it is such a family affair, with recipes I created with Kai and Ryder and some of the girls’ favourite dishes. Chicken Meatballs recipe from My Kids Eat Volume 2, dropping for pre-sale at 7am AEST, October 1! These meatballs just taste like spring – the peas, the lemon, the mint and the ricotta make them so light and fresh. These are delicious with pasta and a tomato-based sauce, and just as good served cold in school lunch boxes the next day. Preheat oven to 240°C. Grease and line a small shallow roasting pan with baking paper. Place peas in a medium heatproof bowl. Cover with boiling water and stand for 1 minute; drain, reserving 2 tablespoons of the water. Blend or process peas, reserved water, rind and chopped mint until just combined. Combine chicken, garlic, breadcrumbs and egg in a medium bowl; mix well. Stir in pea mixture and ricotta. Roll level tablespoons of mixture into balls using wet hands. Place in prepared pan and drizzle with oil. sauce is hot. Season sauce to taste. Meanwhile, cook pasta in a large saucepan of boiling water until just tender. Drain. Serve pasta with meatballs and sauce. Top with extra mint and parmesan. Made it? Tag me in your photos @sophie_guidolin. Can’t wait for My Kids Eat Volume 2? Thanks so much for this recipe! I’ve made these twice now and tripled the recipe both times. Not only do I love these but my two toddlers love them too. We have them on their own served with veggies or salad as well as in a sauce with pasta. Yum!